Case Study—Recognizing that the movement of cars on the road involves inherently social action, Nissan hired a team of social scientists to lead research for the development of autonomous vehicles (AVs) that engage with pedestrians, bicyclists, and other cars in a socially acceptable manner. We are expected to provide results that can be implemented into algorithms, resulting in a challenge to our social science perspective: How do we translate what are observably social practices into implementable algorithms when road use practices are so often contingent on the particulars of a situation, and these situations defy easy categorization and generalization? This case study explores how our cross-disciplinary engagements have proceeded. A particular challenge for our efforts is the limitations of the technology in making observational distinctions that socially acceptable driving necessitates. We also illustrate some of the significant successes we’ve already achieved, including the identification of road use practices that are translatable into AV software and the development of a concept, called the Intention Indicator, for how the AV might communicate with other road users. 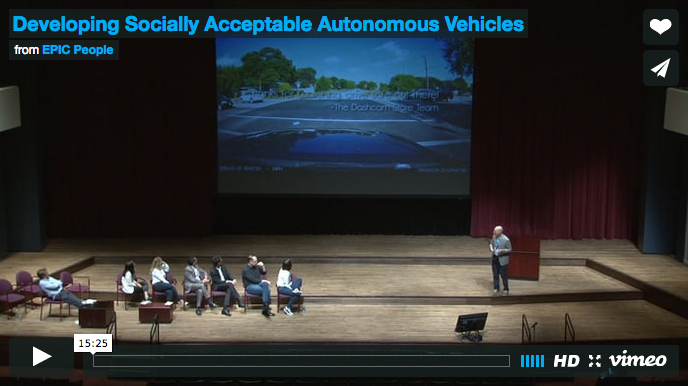 We continue to investigate road use to uncover and describe the ways in which the social interpretation of the world can enhance the design and behavior of AVs.